Vice President Mike Pence makes another stop in Iowa to promote GOP tax policy and its benefits to American workers. DES MOINES — Vice President Mike Pence says the Trump administration is putting Washington to work for Americans, not the other way around. “The forgotten men and women of America are forgotten no more,” Pence told attendees of an America First Policies event to promote President Trump’s tax-cutting policies on Aug. 15 at the Community Choice Credit Union Convention Center. Trump signed into law the Tax Cuts and Jobs Act in December 2017, which reduces rates for businesses and individuals and increases the standard deduction, the amount of income not subject to taxation for nonitemizing taxpayers. Critics of the federal policy contend that corporations and wealthier people will reap the majority of the benefits as the policy is fully phased in, further contributing to wealth inequality in the U.S. Proponents of the GOP tax law, however, argue that the law spurs greater capital investment, which they expect to indirectly benefit people in lower income brackets through increased productivity and pay raises or bonuses. Republican officials on the state and federal levels provided anecdotal evidence on Aug. 15 of businesses small and large boosting compensation for workers and promoting economic growth thanks to GOP tax policy. “A $1,000 bonus in your paycheck that you weren’t expecting at the end of the year, you know, I think that’s kind of a big deal,” Pence said. Pence also touted economic growth under Trump. The U.S. Bureau of Economic Analysis shows GDP grew 4.1 percent in the second quarter this year, the highest yet in Trump’s presidency. The previous period with greater growth was the third quarter of 2014, at 4.9 percent during Barack Obama’s presidency. Iowa Republicans seized upon the federal policy change to make tax changes at the state level, with Gov. Kim Reynolds signing off on a GOP tax bill in May. Reynolds said on Aug. 15 this will better allow the state government to invest in priorities such as education and mental-health care. The state Legislature in the spring boosted K-12 education funding but cut the budget for higher education, restoring only $8.3 million of a $10.9 million cut made earlier in the year. The Legislature also passed measures to expand mental-health services. “This is about Americans and Iowans keeping their hard-earned dollars, because [they’re] yours, after all,” acting Lt. Gov. Adam Gregg said, contending that the savings and bonuses are not merely “crumbs,” as U.S. House Minority Leader Nancy Pelosi has said, they provide gas, groceries, and clothing for families. “… It’s unleashing opportunity across the state,” he said. 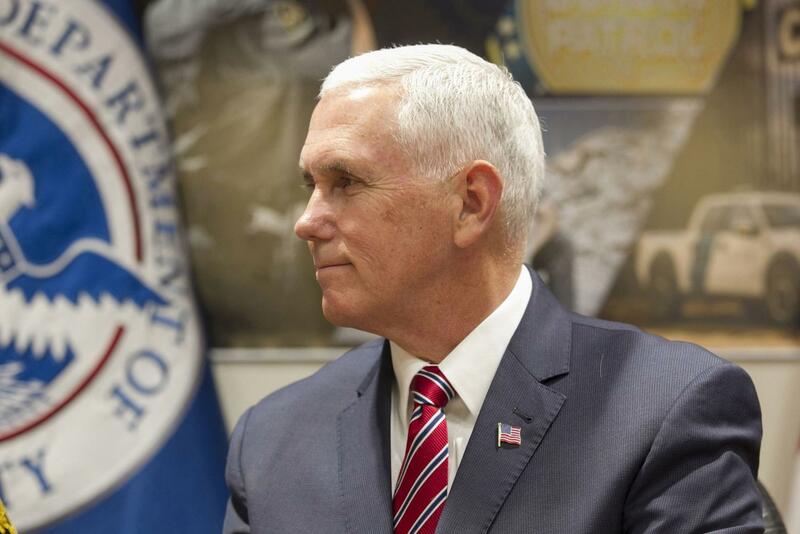 Pence’s visit comes as White House officials have paid visits to Iowa with increasing frequency in recent weeks, gearing up for the November midterm elections to provide a boost to GOP candidates seeking re-election. Some politicos and other observers believe many seats occupied by Republicans are vulnerable in the face of what may turn out to be a blue wave of Democratic support in the midterms. Trump’s approval ratings continue to hover below 50 percent (42 percent on Aug. 16), a test of Trump’s favorability among the American electorate. Trump and Pence in July each made a stop in Iowa’s 1st Congressional District, where incumbent Rep. Rod Blum, R-Iowa, faces a tight race against state Rep. Abby Finkenauer, D-Dubuque. Pence on Aug. 15 stopped at an event for Rep. David Young, R-Iowa, in Ankeny before making his remarks in Des Moines. Young’s opponent in the race for Iowa’s 3rd Congressional District is Democrat Cindy Axne, a small-business owner from West Des Moines. Both races are rated “tossups” by the Cook Political Report. “Now the liberals, led by crazy Cindy Axne and wacky Fred Hubbell, they want their misery back,” conservative radio-show host John Fredericks has said. Hubbell, a businessman running as the Democratic candidate for Iowa governor against Reynolds, has indicated he favors some tax increases to fund state initiatives and has criticized the GOP’s tax cuts for large companies. There’s only one way to sum up the time since Trump took office in January 2017, Pence said.